Changi Airport's Terminal 4 will open on Oct 31, marking a milestone for the airport as it rolls out new technology, systems and procedures that could shape the future of air travel in Singapore. For the first time here, a facial recognition system that will capture a passenger's photo at different stations, centralised security screening, and start-to-end self-service options for check-in and other processes will be used. The plan is for T4 to be a test bed for new ideas and technology that can be replicated at other terminals and on a larger scale at the future T5. Announcing the opening date in a Facebook post yesterday, Transport Minister Khaw Boon Wan said that since construction was completed last December, T4 has undergone extensive trials. To date, Changi Airport Group (CAG) has conducted more than 100 trials, involving 2,500 airport staff and 1,500 volunteers, he said. "After endless rounds of testing and fine-tuning, we are ready to open T4... Another big step forward in our journey as a global air hub," he wrote. CAG executive vice-president (airport management) Tan Lye Teck said the tests and trials - including live flights - were important not only to ensure that systems work well, but also to understand how passengers will navigate the new terminal and adapt to the new check-in and other initiatives. Feedback from participants helped fine-tune systems and processes, he added. Nine airlines - the four airlines of the AirAsia Group, Cathay Pacific Airways, Cebu Pacific Air, Korean Air, Spring Airlines and Vietnam Airlines - will operate from the new terminal. To ensure a smooth transition, they will start operating from T4 progressively, starting with Cathay Pacific and Korean Air. Cebu Pacific and Spring Airlines will move on Nov 2, followed by the AirAsia Group airlines and Vietnam Airlines a week after that. After endless rounds of testing and fine-tuning, we are ready to open T4... Another big step forward in our journey as a global air hub. TRANSPORT MINISTER KHAW BOON WAN, on how T4 has undergone extensive trials since construction was completed. There is no Skytrain linking T4 to the other terminals, so those with connecting flights will be moved to a transfer lounge and bussed to T2. They can take the Skytrain to T1 and T3 from there. A public shuttle bus service will also be provided. 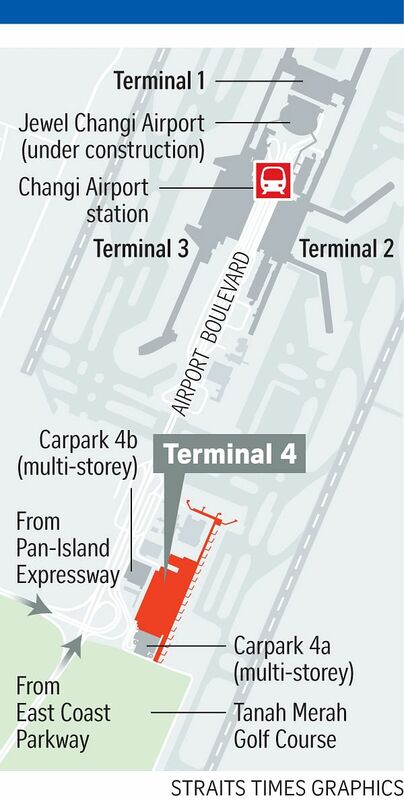 To further improve access to and from the new terminal, existing bus services 24, 34 and 36 serving the airport will call at T4 from Oct 22, the Land Transport Authority (LTA) said in a separate statement yesterday. A new route - service 110 - will also be launched to operate between Sengkang and Changi's four passenger terminals, LTA said. With the opening of T4, which can handle up to 16 million passengers a year, Changi Airport will boost its total annual handling capacity to 82 million passengers. The next big capacity injection after this will be when T5 is ready by the end of the next decade. When fully completed, the mega passenger terminal will be bigger than T1, T2 and T3 combined. Apart from the promise of a smooth, hassle-free experience from start to end, T4 presents a visual treat for travellers and visitors. Designed with high ceilings and open spaces, it projects a modern, clean look. Highlights include a Perakanan-themed heritage zone featuring a six-minute cultural show and a 70m-by-5m wall showcasing Singapore's skyline and Asean landmarks, as well as an animated clip on suitcases being screened. At the heart of T4 is a grand-scale kinetic sculpture, Petalclouds. Spanning 200m, it depicts clouds moving slowly through the horizon.